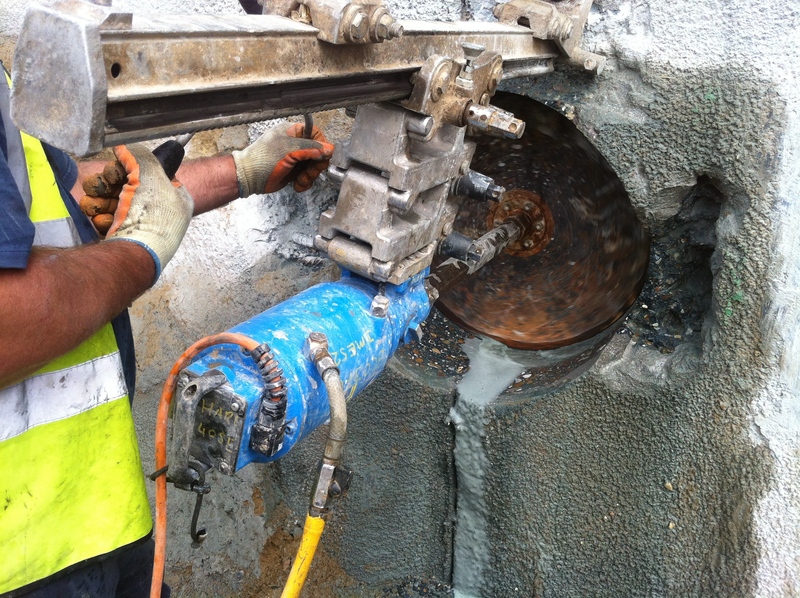 Diamond drilling provides a very quiet Precise and neat and non percussive way of forming holes wet or dry through all types of aggregates, e.g. concrete, brickwork and various materials, leaving no spoiling to either side. This is a non-vibrational method of works, enabling holes ranging from 10mm diameter up to 1.2m diameter to be accurately cut to almost any depth required. This can also be carried out by using strict water / dust control attachments to keep a clean working environment. We offer free expert and technical advice to help with achieving quality and cost effective results. Various sized Drill bits with diamond segments welded to one end are mounted onto various sized drill rigs powered by electric, air or hydraulic motors. Diamond drilled holes can be drilled horizontally, vertically and inverted in confined spaces. Diamond stitch drilling is a commonly used method where a large or abnormal shaped opening is required, A series of holes are linked together to form the required opening. Are you interested in Diamond Drilling?